Richard Kobak says he suffered a concussion, whiplash, and two holes in his knees while performing as Spidey. In this theater publicity image released by The O&M Co., a scene is shown from "Spider-Man: Turn Off The Dark," in New York. A stuntman who claims he suffered a concussion, whiplash and two holes in his knees while performing as the comic book hero in Broadway's "Spider-Man: Turn Off the Dark" has asked producers to turn over any relevant information as he weighs pursuing a negligence lawsuit. The stuntman, Richard Kobak, claims in a series of papers filed earlier this year in state Supreme Court that he suffered the leg injuries in 2010 while filling in for another injured stuntman at the most expensive show in Broadway history. 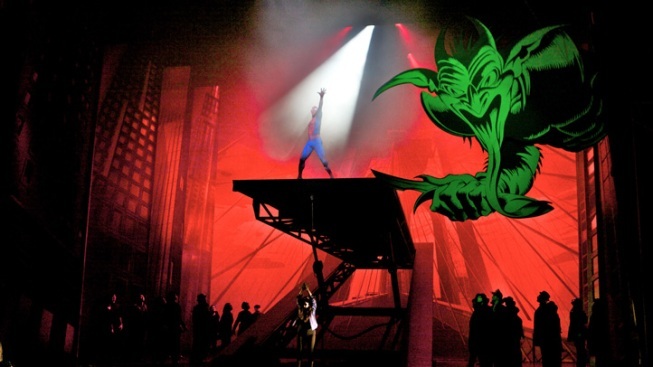 He alleges that the rigging he used for the show's aerial acrobatics wasn't recalibrated for him and, as a result, he made 70 hard landings on stage during performances and rehearsals. He says the hard landings created a 1.4-millimeter hole in his right knee and a 9-millimeter hole in his left knee. He also alleges that a computer program controlling one of his jumps from a balcony sent him flying into a wall on April 5, 2011. He says he suffered two herniated discs, whiplash and a concussion. In a statement released late Wednesday, Rick Miramontez, a spokesman for the producers, said: "The producers have no comment on the matter except to wish Mr. Kobak, who is currently in the 'American Idiot' tour, well." During the production's rocky start, several accidents marred performances. One actor, Christopher Tierney, suffered a fractured skull, a fractured shoulder blade, four broken ribs and three broken vertebrae during a fall on Dec. 20, 2010; he made a triumphant return to the show. A lead actress, Natalie Mendoza, suffered a concussion during the first preview performance and left the show, which has been a huge box office draw since its doors opened..
Kobak's court papers seek memos, emails or any other evidence about the computer program and the equipment, copies of accident reports prepared by producers and any other relevant papers to "determine if there is a viable claim." The filings are hardly the only legal headache the producers face. In November, fired director Julie Taymor slapped the producers — led by Michael Cohl and Jeremiah J. Harris — as well as Glen Berger, her former co-book writer, with a federal copyright infringement lawsuit, alleging they violated her creative rights and haven't compensated her for the work she put into the $75 million show. In January, the producers filed a counterclaim asserting the copyright claims are baseless.